From very modest beginnings GLOBAL has developed into one of the success stories of the 1990's. Still crafted by hand in Yoshikin's factory in Niigata to the most exacting standards, they are sold in more than 65 countries around the world where they are attracting ever more attention and acclaim. During the last few years GLOBAL knives have won a number of prestigious awards. 2006 - GLOBAL knives were selected as one of "Japanese Mdern 100 Awards, so-called "J-Mark" by The Japaneseque Modern Committee. But formal awards alone can barely act as a testimony to the many thousands of delighted customers of GLOBAL throughout the world. GLOBAL knives are favoured today by most high ranking chefs in the most prestigious hotels and restaurants and are featured regularly on television cookery programmes in the hands of the most celebrated chefs. They are displayed at most international catering and housewares exhibitions. 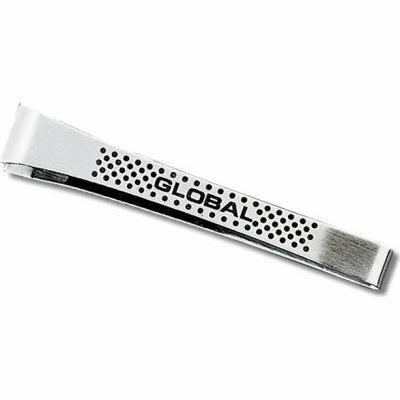 Meanwhile, the design and production team continue to look for ways of expanding and developing further the GLOBAL knife range, taking into account the many suggestions and proposals received from current GLOBAL knife users throughout the world.